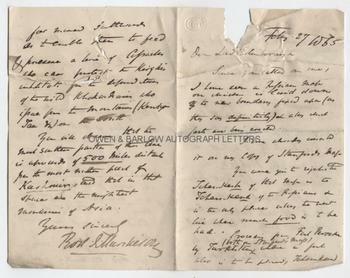 SIR RODERICK MURCHISON Autograph Letter Signed. Sir Roderick Impey Murchison. British (Scottish) geologist. The first to classify and name the Silurian system of rocks. ALS. 4pp. No place. February 27th 1865. To Lord Ellenborough. "Since you called on me, I have seen a Russian map on which is laid down the boundary fixed upon (as they say, definitively) and along which forts are now being erected. I have already created [?] it on my copy of Stanford's map. You were quite right. The Tchan-kesh of that map is the Tchan-kand of the Russians and is the only place along the new line where much food is to be had. Proceeding from Fal Parooke by Turkistan (both on Stanford's map) where a fort is to placed, Tchan-kand is the most s[outh] easterly point of the whole line. There the line goes eastward to Issikal (Lake), linking the . . . [?] mountains which form the northern boundary and Khokand . . . [?] to the east. Making a bend to the north, the line leaves the mountain of Kizikurtata and thence runs by Pishpek and Tokmak to Issikal Lake. At Issikal it does not include the whole lake, but leaves the southern half to the Khokandians. The Russian fort at the east end of the lake is, as you will perceive, on the frontier of China. In this part of their course the Russians deviate [?] some ground and divide the water of the Issikal as we do the lakes of North America with brother Jonathan. The yellow boundary marked on Stanford's map was never . . .[?] established and was unprovided with forts which, owing to the sterility of the tract could not be found there. The Russian version is that their line is just so far . . . [?] southward as to enable them to feed and preserve a line of Cossacks who can protect the Kirghis inhabitants from the . . .[?] of the wild Khokandians who issue from the mountains (Kendya Tau) or the south. You will observe that the . . . southern portion of this line is upwards of 500 miles distant from the most northern part of Kashmir and that in that space are the mightiest mountains of Asia." 8vo. Approx 7.5 x 4.5 inches. Both leaves are torn at top portion with some small losses which, for the greater part do not touch or affect the text. A few creases. All else is very good. Roderick Murchison one of the first to immerse himself in the new science of Geology and was one of the first members of the Geological Society, with Charles Darwin, Charles Lyell, Adam Sedgwick and William Buckland. He was the first to classify and name the Silurian System of rocks and was instrumental in the classification of the Devonian. Roderick Murchison was appointed Director-General of the British Geological Survey in 1855 and also served as President of the Royal Geographical Society. 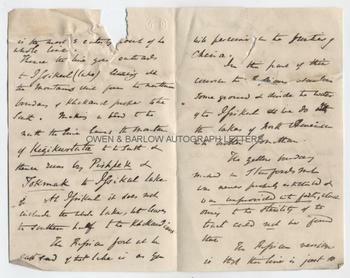 During this period, his time was mostly taken up with official duties and it is in this capacity that he is here writing to Lord Ellenborough. Lord Ellenborough had previously only sought Murchison's advice on the opening of quarries on his estates but in 1864 he turned to him for advice on Russian movements and fortifications along its Asian borders. Roderick Murchison was knowledgeable on the geography of Russia having undertaken three expeditions to the area and he had both personal and professional allegiances with both Russia and India. This was a time when there was much disquiet about Russian intentions towards British India. Roderick Murchison argued against the often strident voices (including those of Sir Henry Rawlinson) who warned of a Russian invasion and the threat of "the Great Bear coming over the passes". Roderick Murchison was a more calming influence, who pointed to the geography and geology of the region as making such moves by Russia unlikely. He criticised those who "only look at Asia on maps of 100 miles to the inch" and he was not prepared to allow the Royal Geographic Society to be used as a pulpit for those wanting to hector or threaten Russia. According to Robert Stafford's book 'Scientist of Empire: Sir Roderick Murchison, Scientific Exploration and Victorian Imperialism', Roderick Murchison's remarks were noted with approval in St. Petersburg and he was passed messages of thanks from his highly placed Russian friends. The spelling of Russian place names is archaic (or else we have misread Sir Roderick's writing!) but Issikal can be identified with Lake Issyk Kul ,which lies in the north-easterly corner of present day Kyrgyzstan near the Tian Shan Mountains. 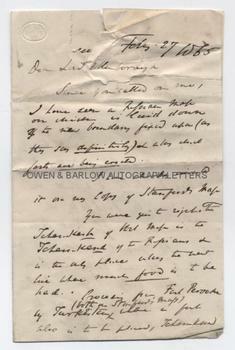 An interesting letter of some historical significance.